I'm craving this for tonight! Last year, on the way to New York, we stopped in New Jersey to visit my aunt and ate dinner at Trinity. This cute restaurant is set inside an old church. My aunt and I both ordered the Sweet Corn Risotto. It was so good that I'd thought I'd make my own version at home and it turned out creamy and delicious. The best part about it is you get to use sweet corn and tomatoes while they're in season. Remove the kernels from the corn cobs and reserve. Snap the corn cobs in half and add them to a medium saucepan along with the stock and milk. Bring to a simmer then reduce the heat to low. In a small stockpot over medium heat, brown the bacon. Once it starts to get crispy, add the onion and saute until translucent. Add the garlic and the rice and toast until the rice is golden and smells nutty. De-glaze with the wine. Stir the risotto occasionally with a wooden spoon as it cooks over medium heat. Continuously add ladle-fulls of stock as each previous ladle of liquid gets absorbed into the risotto. Continue stirring and adding stock for about 20 minutes, then add the reserved corn kernels and continue as before. When the risotto gets creamy, add the cream and cook until done (should be 1-2 minutes at this point). Finish the risotto by melting in the Parmesan cheese. 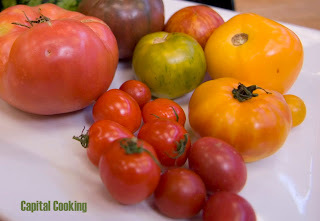 Add salt and pepper to taste Toss in tomatoes and herbs and serve. I like to serve with cheesy garlic bread on the side. I love this recipe - not only can attest to its deliciousness first hand, but it was also an uncomplicated and fresh recipe! Thanks Claire! It was so fun hanging out with you!